If you remember our 2012 anniversary issue, you might recollect that OVERDRIVE was the first publication to review the Triumph Bonneville T100 in India, even before the bike's formal launch. 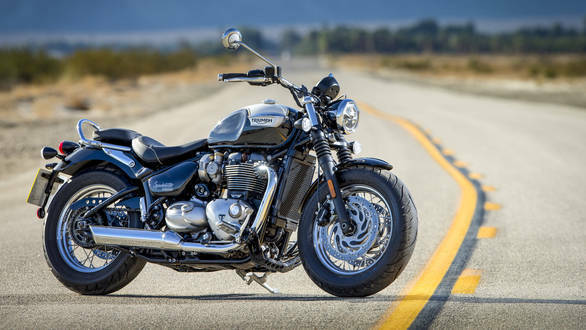 That of course was long back  the new generation T100 broke cover about two years ago and more importantly the current generation Bonneville family includes the entry-level Street Twin, T120, the Bonneville Street Scrambler and the Bonneville Bobber as well. The newest addition to the family though is the Bonneville Speedmaster that was revealed to us last year at Triumph's Hinckley factory, where it also opened the doors to its all-new Experience Centre. The Speedmaster isn't a new name though as Triumph sold the Speedmaster till 2015 internationally. The new generation Speedmaster is coming to India as well and will be launched around March-April 2018 and Triumph literally flew us across the world to San Diego in California, USA to ride the bike. Not surprising since cruisers are quintessentially American, no? 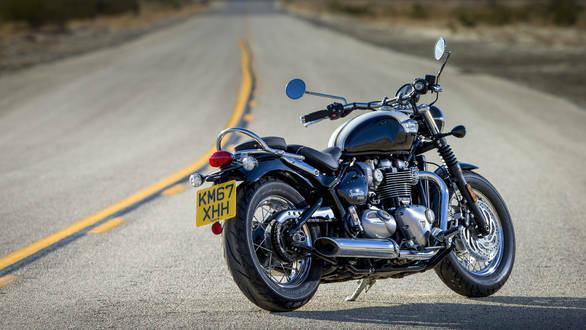 The Bonneville Speedmaster is the seventh member of the current generation Bonneville family. It is a full-fledged cruiser and also a motorcycle that will appeal to a wider audience than the Bobber. The Bobber has been received well but isn't exactly practical as it comes with a single seat only. The Speedmaster is largely based on the Bobber but not entirely as the basic frame and the 1200cc, liquid-cooled parallel-twin engine powering it are the same but the suspension is different. 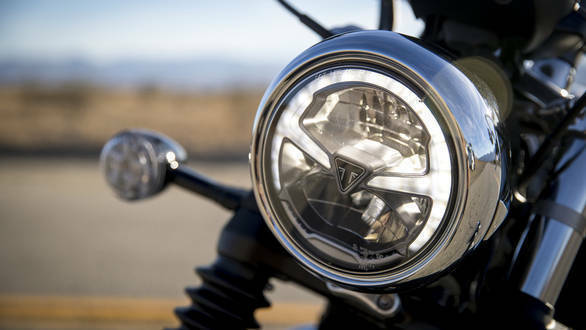 The new Speedmaster gets the same round, full-LED headlight as the Bobber Black (the standard Bobber sold in India does not get the LED headlight). I also like the hardtail look as the rear suspension is pretty much hidden from view. The monoshock though is different from the Bobber's to handle the additional payload of a pillion and luggage and also uses dual rate springs. Upfront the Speedmaster uses 41mm cartridge front forks (unlike the Bobber's 47mm forks) while the 130-section front tyre (specially developed Avon Cobra) is the same as the Bobber, along with a 150-section rear tyre. The Speedmaster also uses the same twin 310mm discs as the Bobber Black upfront (standard Bobber gets a single front disc). The Speedmaster comes with a 12-litre fuel tank that looks similar to the rest of the Bonneville family's. 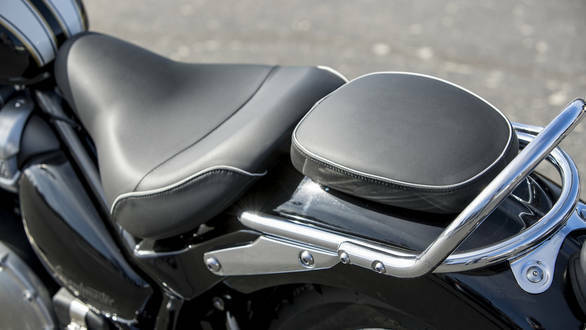 The seat is different and needless to say, the Speedmaster has a pillion perch too along with a stainless steel rear grab handle. 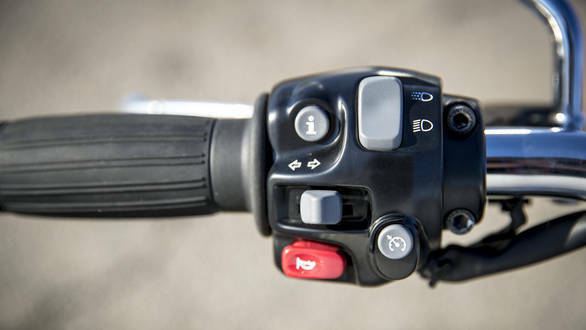 The handlebar is low set and wide, while the instrument cluster is the same single-pod unit as the other Bonnevilles and offers good amounts of information. The Speedmaster comes with twin chromed exhausts, one on each side. Like the other Bonnevilles it boasts excellent build quality and fit-finish levels, which is a bigger highlight than the styling itself. The bodywork, panels and switches are all nice to the touch while paint quality is excellent. The finishing of the engine also adds to the looks  the cylinders wear matte black paint with a machined finish while the bottom half gets a buffed steel finish. 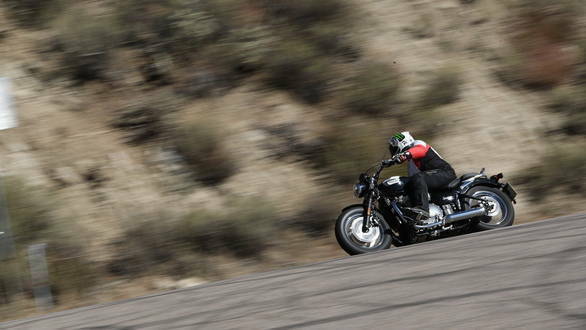 On the whole the Speedmaster is a well-built, well-finished motorcycle and feels very premium. Like the other Bonnevilles, attention to details is excellent with the Triumph name and logo finding place on various parts of the bike. The Speedmaster boasts an elaborate equipment list. The list includes cruise control that can be operated swiftly using a single button on the left handlebar and ride by wire which brings with it the convenience of two riding modes  Road and rain. Both offer the full performance though throttle response is dulled in Rain. It also comes equipped with switchable traction control, ABS and an immobiliser too. Swinging a leg over the Speedmaster feels like you are sitting on the bike rather than in it. Seat height is low at 705mm, the handlebars are wide and you sit with your feet forward which adds to the cruiser-esque feel. I'm also impressed with the ease of reaching the switchgear, while the clutch lever feels light, unlike what you expect of cruisers. Fire up the engine and you're treated to a sound that's more V-twin than parallel-twin and Triumph has hit the nail on the head in the acoustics department. The exhausts also emanate a nice rumble when you roll off. The 1200cc parallel-twin engine is in the same state of tune as the Bobber and offers 77PS and 106Nm. I remember appreciating the engine's bottom-end grunt on the Bobber and it offers a strong thrust on the Speedmaster as well, whether you're accelerating from standstill or exiting corners. It comes mated to a six-speed gearbox and we had no trouble riding in third gear at low speeds in the city thanks to the strong bottom end grunt. What's also impressive is how smooth the engine is as there's almost no vibration unless you're on a mission to murder the engine at peak revs. 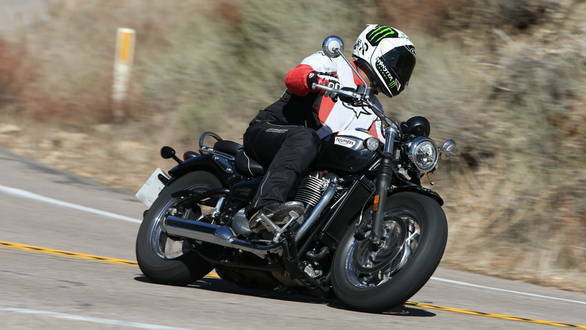 We headed out of San Diego and into the neighbouring hills where the Bonneville Speedmaster was a joy. It does not feel intimidating and is very friendly for a full-fledged cruiser. Triumph hasn't revealed the kerb weight which should be in the region of 260kg considering the bike's dry weight of 245.5kg. This isn't too heavy for a cruiser and helps the handling. It didn't take us time to start flicking the bike from side to side as it feels light on its feet, also courtesy the sharp steering geometry. Which brings me to the Speedmaster's Achilles Heel, the low set footpegs. Like most cruisers the pegs are rather easy to ground which slows you down despite the potential the chassis and suspension hold. The roads we rode on were bumpy and in weren't significantly better than Indian roads. This helped me get a good sense of the ride quality and as the bike soaked in undulations well but wasn't exactly plush. The setup is firm but not stiff, which helps in offering an engaging feel in the hills. Of course, munching miles on California's wide, open freeways was cakewalk for the Triumph  it made light of covering distances and felt perfectly at home on the highway. That said, I would have liked the seat to be deeper to offer better support to the lower back and thus aid the bike's touring credentials better. Triumph has launched the Bonneville Speedmaster in India, pricing it at Rs 11.11 lakh ex-showroom. At the price it does make a strong case for itself with its classic design and low slung stance, the premium quality and fit-finish levels as also its engine's impressive refinement and performance levels. The Speedmaster certainly benefits from Triumph's legacy of making good handlers as well. So initial impressions are that it is a well-rounded package and has the potential do well in India given our love for cruiser motorcycles.